“Attention”, Daniel Goleman tells us*, “is the gathering of information crucial to existence. Anxiety is the response when that information registers as a threat. Denial. A powerful tool frowned upon: but Dr Goleman argues that our whole lives are an intricate dance with attention and anxiety as partners. We choose what we want to attend to, and some things are just too painful to see. I live just couple of miles from a high security psychiatric hospital housing Peter Sutcliffe, the Yorkshire Ripper, and a short car ride away from the Atomic Weapons Establishment. I never turn a hair. Kilauea in Hawaii: locals have reported 65 foot blasts of lava and collapses in the crater floor, and still the tourists come in their hordes. Some have probably also visited Pompeii where a great city simply turned a blind eye to the monster on the horizon, and those who chose this path are petrified for all to see even today. Those are extreme examples. Day to day, some of us are really very good indeed at painting a wonderful life: downplaying or ignoring the painful or worrying. For a very long time, man has been advocating attention to those things we’d like to ignore. I have two short examples for you today. The first lives at St Cross Hospital in Winchester, UK. It is a really rather beautiful set of houses, an ancient community set up between 1133 and 1136 by William the Conqueror to house the poor. 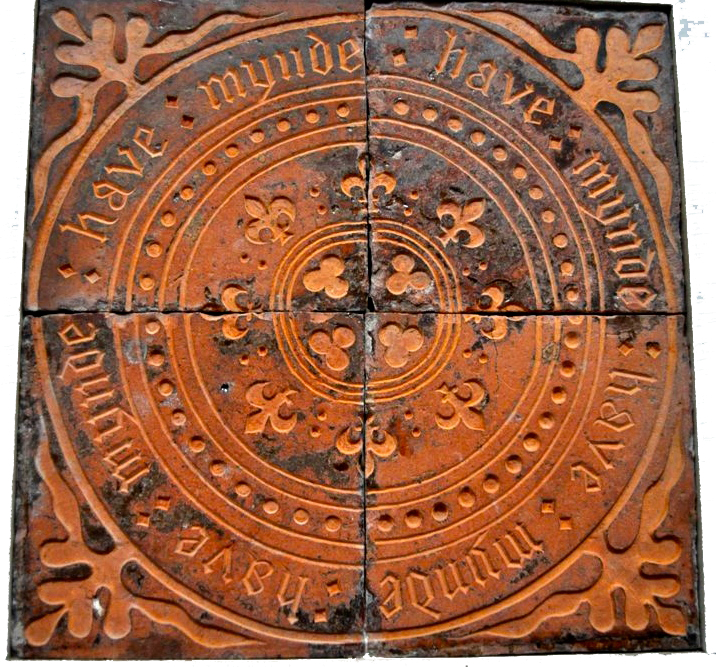 The four tiles have no explanation posted nearby: they are mounted on the wall near to the centre of the Hospital’s cruciform chapel. I love the fact that it is a circle. A circle with twin messages: be vigilant, always, forever, it says. Live in each moment and be mindful of the joy that can dwell in any instant. An then again, it prods, pay attention to those parts of your mynde that warn you, the psychological batsqueaks which can be silenced and anaesthetised by a healthy dose of inattention. Interestingly, my second source also chooses a circular motion to portray a similar message. Dr Daniel Goleman’s Vital Lies, Simple Truths is a cracking read. You can find it here. Posted in Uncategorized, WhimsyTagged anxiety, attention, Dr Daniel Goleman, Mindfulness, Simple Truths, St Cross Hospital, Vital Lies, WinchesterBookmark the permalink. I was a manager in those times. Elpeth, and I remember it well. I was sent on my fair share of courses…but if you follow some of the leads you get to interesting places. Because of one of them I ended up studying meditation at one of the foremost centres in the UK, and I went on to read and use a few methods extensively – particularly written reflection. Which has led me here to do what I do now. I love Daniel Goleman simply because he makes his ideas accessible. And for me, what he writes rings very true indeed in life. And now I’m off to find Kolk and read him…. Without knowledge of this part of your history, I did know it from your writing. I also am grateful to Goleman for making emotion a strong word that could be used … sometimes … without the eye-rolling of the majority of colleagues. People delude themselves all the time and when a “message” counters their deeply held “fraudulent truths” . . . they toss the messenger into the closet, slam the door, and ditch the key! Nancy, you have just described what I do all too often…but by degrees I notice more and more. I doesn’t stop me, like Dr Hufaffarr there, putting a picture in the cupboard now and then. Hello Celi! How are you? I hope the farm is well and shall be along shortly to catch up. Thank you: it is very pertinent for me right now to Have Mynde. I am an ostrich really. Ha 😀 Indeed, BB. Really lovely to have you visit. What’s that heavy rumbling and look at all that smoke? I guess we sometimes see only what we want to. Quite. Got to watch that selective attention…. My children are masters at selective attention. They wouldn’t register the word “homework” if it was played through a sound system at 120dB, but they can hear the rustling wrapper of my chocolate bar from the other side of the city.